I finished the back for Salina yesterday! I am now a few inches into the sleeves. We totally hibernated this weekend, which helps with the knitting progress. I decided to do the sleeves (both at the same time) in between the front and the back for two reasons. 1. Sleeves are most often when I get stalled, so getting them out of the way is a good thing and 2. The front and back are essentially the same until you get to the top. Doing them in a row might get boring. 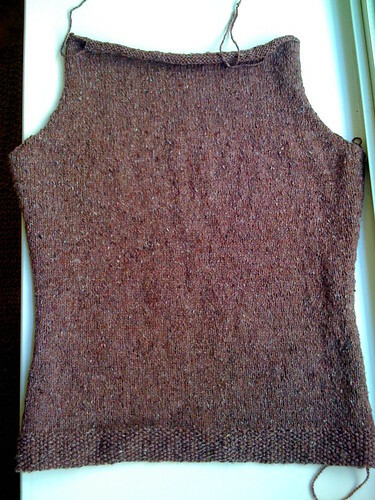 Who am I kidding…the miles and miles of stockinette are pretty boring, but I am really loving the results. I did have a scare this weekend. My yarn closet is a mess and I was in there looking for the rest of the yarn for Salina. I tore everything apart, still no yarn. It wasn't until I pulled out a bag of organic cotton that I realized I had stuffed the yarn in the bottom of that bag. For a second there, I was worried that I had used it on something else or given it away and just not remembered it! Luckily, crisis averted, and sleeve knitting commenced. Previous post ← Saturday Sky – Bird Meeting! so fast! you’ll be done with this in no time!